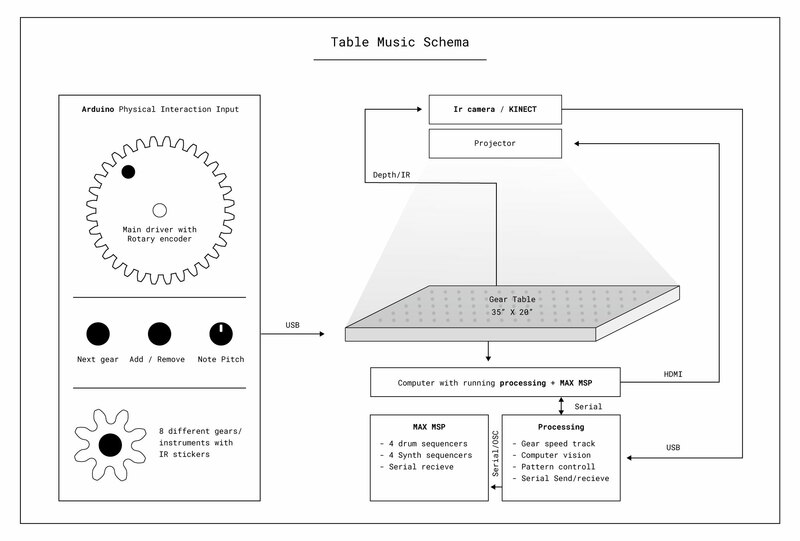 Musical Gear Table is my PCOMP / ICM Final for the 2017 fall semester in ITP, Tisch School of Arts. It is a musical / visual experience Which draws inspiration from physical / mechanical music boxes and gives it a digital interpretation. 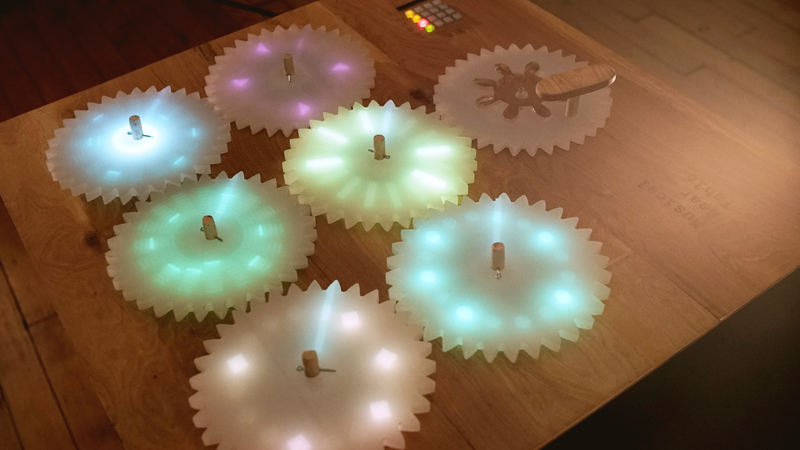 The user assigns different musical patterns to six different instruments through digital inputs and rotates the physical gear to produce sound. 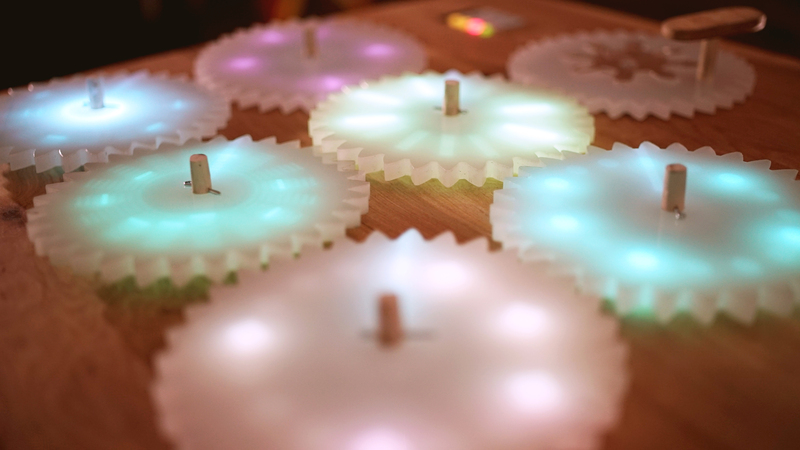 The digital layer is projected on the physical gears and give the musical patterns unique visualization. I have always had an attraction to music and its structure. Drums always come first – High-hat that counts the tempo, kick drum drum that lays the beat down and the snare that snaps and brings the sharp staccato to the beat. Of course, after that comes the baseline, the melody and the harmony- synths keys, and everything else. 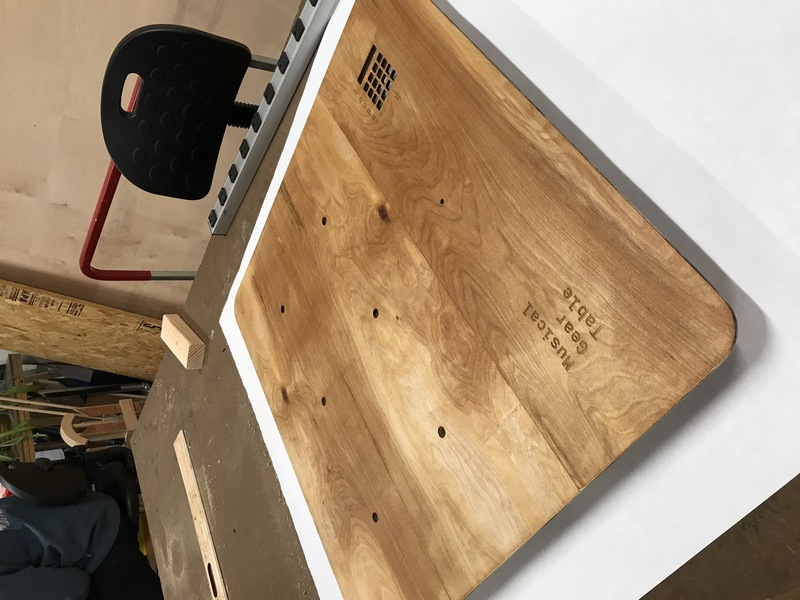 The initial plan was to build a table filled with gears of different sizes. 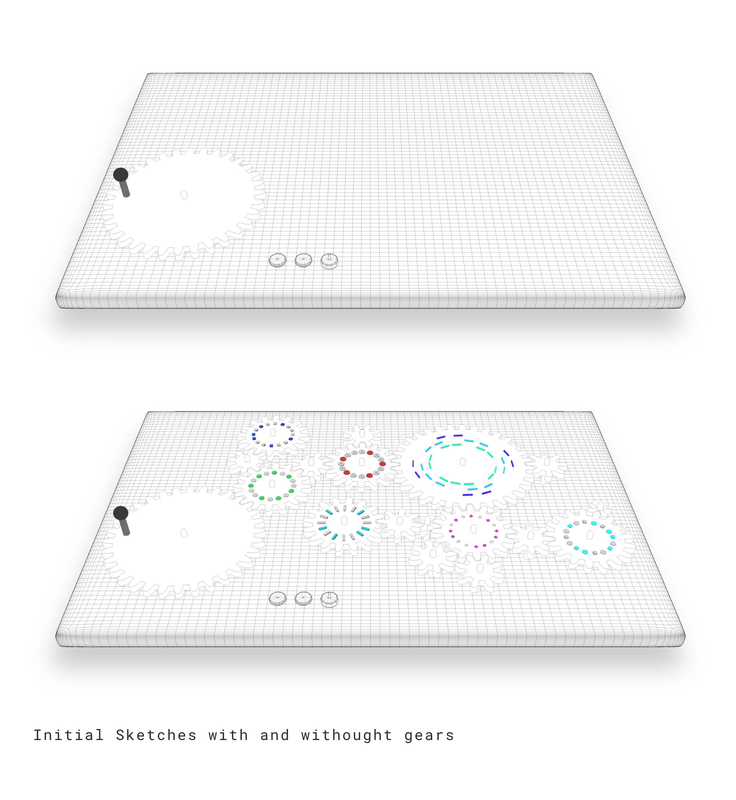 The user will be prompted to build his own composition with the gears, similar to a puzzle. When done, he can turn the main gear – thus moving all the gears in correlation to that main gear. Each gear holds a certain element of the composition – a drum, cymbal, baseline, keys, synths and more – and the user can choose weather he wants to add it to the recipe or not (editing a certain gears notes is an option too). Another element for this project is the visual projection. On each gear will be projected a visualization of the it’s instrument’s pattern . The user could change samples and patterns through an interface incorporated in the project. Thought process led to incorporate different size gears that would lead to polyrhythms in the track. This idea was eventually left behind. The initial technical specs included a Kinect controller(which was later dropped from the plan), Max MSP, Arduino and a limited set of buttons that were to control the array of gears, that plan changed later in the process. Starting with physical exploration of laser cutting acrylic sheets I built a small mockup of the mechanism. This small prototype had a rotary encoder in it that picked up the current position of the gears and transmitted it VIA Arduino’s serial to the processing. The instruments used were different drum samples and two synthesizers built in Max/MSP. After getting the audio part to work, I’ve started to build a working demo that incorporated a projection of the instrument’s pattern on the gear and the ability to edit an instrument’s pattern. 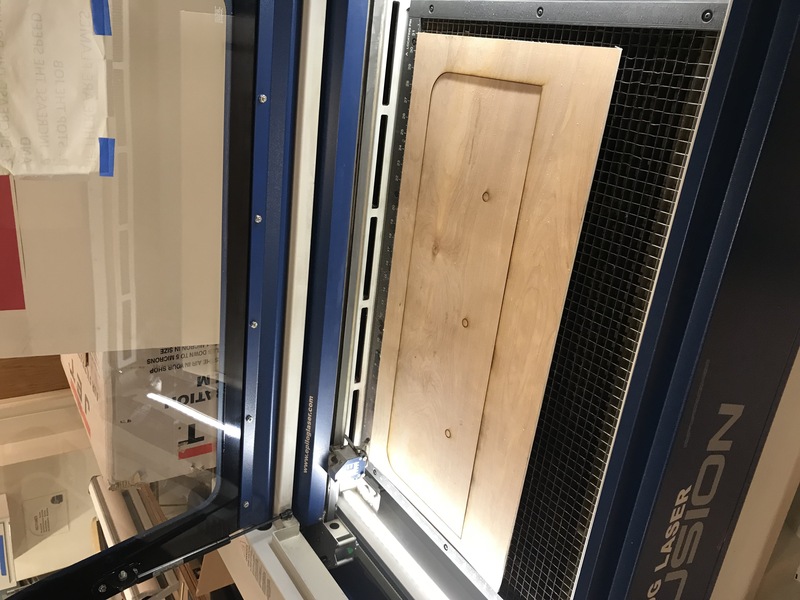 I cut a thick piece of white acrylic sheet and mounted a two gears on a plank of wood. Next step was to scale and produce a large prototype of all the gears. In this process I designed the final version of the table in Illustrator and laser cut it from birch wood. In this process I’ve added an Adafruit trellis controller that was mounted on the bottom part of the table. this controller is programmed to scroll between gears, add/remove notes and assign patterns from 12 different banked presets. also, I have incorporated a soft potentiometer to handle pitch shifting in the notes. 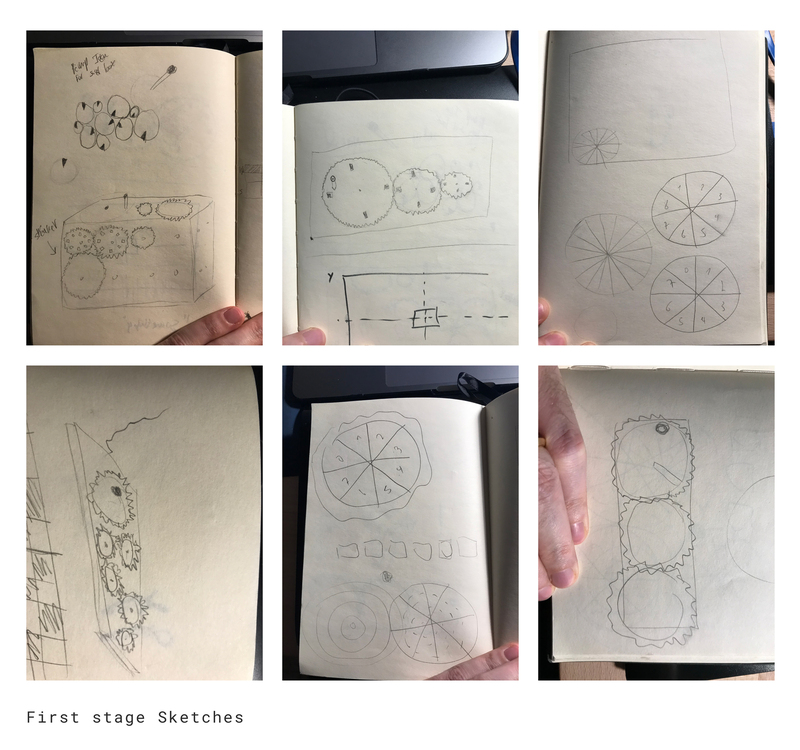 Design for the visual representation of each instrument was made in consideration of the instrument’s tone and shape of its sound, for instance, the bass drum would be round, snare would be sharp etc. synthesizers would have the ability to change their tone and pitch so layers of shapes were stacked and patterned on the gear to display the selected note. Musical Gear Table was presented at the 2017 ITP winter Show, Below you can find a couple demo video from users in the show.